SINGAPORE - Clasping hands and forecasting future peace, President Donald Trump and Kim Jong Un committed Tuesday to “complete denuclearization” of the Korean Peninsula during the first meeting in history between a sitting U.S. president and a North Korean leader. 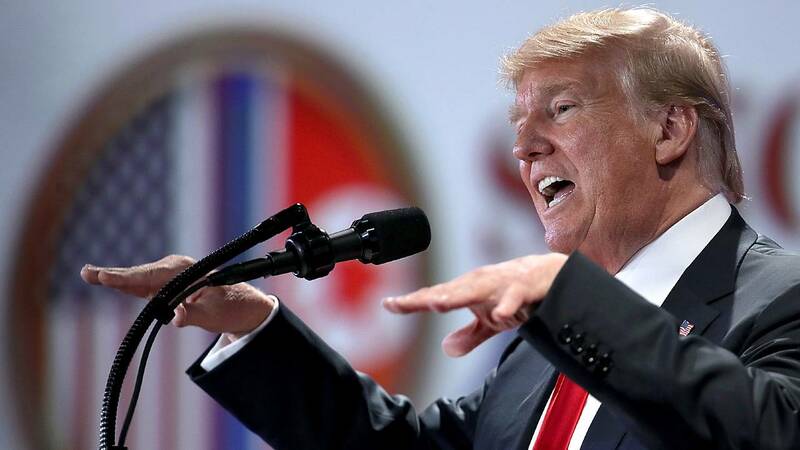 Yet as Trump toasted the summit’s results, he faced mounting questions about whether he got too little and gave away too much — including an agreement to halt U.S. military exercises with treaty ally South Korea. THE PRESIDENT:* *Well, thank you very much, everybody. We appreciate it. We're getting ready to go back. We had a tremendous 24 hours. We've had a tremendous three months, actually, because this has been going on for quite a while. That was a tape that we gave to Chairman Kim and his people, his representatives. And it captures a lot. It captures what could be done. And that's a great -- a great place. It has the potential to be an incredible place. Between South Korea -- if you think about it -- and China, it's got tremendous potential. And I think he understands that and he wants to do what's right. I also want to thank President Moon of South Korea. He's working hard. In fact, I'll be speaking to him right after we're finished. Prime Minister Abe of Japan -- a friend of mine -- just left our country, and he wants what's right for Japan and for the world. He's a good man. And a very special person, President Xi of China, who has really closed up that border -- maybe a little bit less so over the last couple of months, but that's okay. But he really has. And he's a terrific person and a friend of mine, and really a great leader of his people. I want to thank them for their efforts to help us get to this very historic day. Most importantly, I want to thank Chairman Kim for taking the first bold step toward a bright new future for his people. Our unprecedented meeting -- the first between an American President and a leader of North Korea -- proves that real change is indeed possible. Nearly 70 years ago -- think of that; 70 years ago -- an extremely bloody conflict ravaged the Korean Peninsula. Countless people died in the conflict, including tens of thousands of brave Americans. Yet, while the armistice was agreed to, the war never ended. To this day, never ended. But now we can all have hope that it will soon end. And it will. It will soon end. The past does not have to define the future. Yesterdays conflict does not have to be tomorrows war. And as history has proven over and over again, adversaries can indeed become friends. We can honor the sacrifice of our forefathers by replacing the horrors of battle with the blessings of peace. And that's what we're doing and that's what we have done. There is no limit to what North Korea can achieve when it gives up its nuclear weapons and embraces commerce and engagement with the rest of the world -- that really wants to engage. Chairman Kim has before him an opportunity like no other: to be remembered as the leader who ushered in a glorious new era of security and prosperity for his people. Chairman Kim and I just signed a joint statement in which he reaffirmed his "unwavering commitment to complete denuclearization of the Korean Peninsula. We also agreed to vigorous negotiations to implement the agreement as soon as possible. And he wants to do that. This isnt the past. This isnt another administration that never got it started and therefore never got it done. Chairman Kim has told me that North Korea is already destroying a major missile engine testing site. Thats not in your signed document; we agreed to that after the agreement was signed. Thats a big thing -- for the missiles that they were testing, the site is going to be destroyed very soon. Today is the beginning of an arduous process. Our eyes are wide open, but peace is always worth the effort, especially in this case. This should have been done years ago. This should have been resolved a long time ago, but were resolving it now. The current state of affairs cannot endure forever. The people of Korea -- North and South -- are profoundly talented, industrious, and gifted. These are truly gifted people. They share the same heritage, language, customs, culture, and destiny. But to realize their amazing destiny, to reunite their national family, the menace of nuclear weapons will now be removed. In the meantime, the sanctions will remain in effect. We dream of a future where all Koreans can live together in harmony, where families are reunited and hopes are reborn, and where the light of peace chases away the darkness of war. This bright future is within -- and this is whats happening. It is right there. Its within our reach. Its going to be there. Its going to happen. People thought this could never take place. It is now taking place. Its a very great day. Its a very great moment in the history of the world. And Chairman Kim is on his way back to North Korea. And I know for a fact, as soon as he arrives, hes going to start a process thats going to make a lot of people very happy and very safe. So its an honor to be with everybody today. The media -- this is a big gathering of media, I will say. It makes me feel very uncomfortable. (Laughter.) But it is what it is. People understand that this is something very important to all of us, including yourselves and your families. So thank you very much for being here. Well take some questions. Wow. Thats a lot of questions. Go ahead. Sure, go ahead. NBC. Q Thank you, Mr. President. Two questions for you, if you dont mind. First, the man you met today, Kim Jong Un, as you know, has killed family members, has starved his own people, is responsible for the death of Otto Warmbier. Why are you so comfortable calling him very talented? THE PRESIDENT: Well, he is very talented. Anybody that takes over a situation like he did, at 26 years of age, and is able to run it, and run it tough -- I dont say he was nice or I dont say anything about it -- he ran it. Very few people, at that age -- you can take one out of ten thousand, probably, couldnt do it. Q -- on the security assurances you talked about in your statement. Can you be specific about what assurances you are willing to give to Kim Jong Un? Does that include reducing military capabilities? THE PRESIDENT: No, were not reducing anything. Were not reducing. At some point, I have to be honest -- and I used to say this during my campaign, as you know, probably, better than most -- I want to get our soldiers out. I want to bring our soldiers back home. We have, right now, 32,000 soldiers in South Korea, and Id like to be able to bring them back home. But thats not part of the equation right now. At some point, I hope it will be, but not right now. We will be stopping the war games, which will save us a tremendous amount of money, unless and until we see the future negotiation is not going along like it should. But well be saving a tremendous amount of money. Plus, I think its very provocative. Q Frequently -- were frequently confused, Mr. President. THE PRESIDENT: No, not at all. Because if you look at it, I mean, it said we are going to -- lets see here -- it will be gone. I dont think you can be anymore plain than what were asking -- issues related to the establishment of the new U.S. DPRK relations -- the building. We talk about the guarantees, and we talk about unwavering commitment to the complete denuclearization of the Korean Peninsula. This is the document that we just signed. THE PRESIDENT: Yes, we did. Yes, we did. And well be verifying. THE PRESIDENT: Yeah, well be verifying. It will be verified. THE PRESIDENT: Well, its going to be achieved by having a lot of people there, and as we develop a certain trust. And we think we have done that. Secretary Pompeo has been really doing a fantastic job -- his staff, everybody. As we do that, were going to have a lot of people there, and were going to be working with them on a lot of other things. But this is complete denuclearization of North Korea, and it will be verified. Q Ill be very respectful, sir. What did Kim Jong Un say to you to give you the confidence that, for once in the history of North Korea, they are not cheating the system, and gaming the world, and gaming the people who will have to go in and make sure that theyre actually giving up their nuclear arsenal? What did he say to you? THE PRESIDENT: Yeah, I mean, very fair question. He actually mentioned the fact that they proceeded down a path in the past, and, ultimately, as you know, nothing got done. In one case, they took billions of dollars -- during the Clinton regime -- took billions of dollars and nothing happened. That was a terrible thing, and he actually brought it up to me. And he said we have never gone this far. I dont think theyve ever had the confidence, frankly, in a President that they have right now for getting things done and having the ability to get things done. And he was very firm in the fact that he wants to do this. I think he might want to do this as much or even more than me because they see a very bright future for North Korea. So you never know. Right? We never know. But Ill tell you what, we signed a very comprehensive document today, and I think most of you have been given that document. But we signed a very, very comprehensive document, and I believe hes going to live up to that document. In fact, when he lands -- which is going to be shortly -- I think that he will start that process right away. THE PRESIDENT: I do. I do. I can only say that I know him for -- really well, its been very rhetorical, as you know. I think, without the rhetoric, it wouldnt have happened. I think without other things going along -- I think the establishment of a new team was very important. We have a great team. But I do, I think he wants to get it done. I really feel that very strongly. Q Its the angelic glow of the backlighting, Mr. President, that makes us look so similar. Of course, the denuclearization -- nuclear weapons and biological weapons and whatnot -- is one problem in North Korea. Another huge problem is the horrible record that they have on human rights. Was that discussed at all? THE PRESIDENT: Yes, it was discussed. It will be discussed more in the future -- human rights. What was also discussed in great detail, John, was that fact that, you know, we have -- and I must have had just countless calls and letters and tweets, anything you can do -- they want the remains of their sons back. They want the remains of their fathers, and mothers, and all of the people that got caught into that really brutal war, which took place, to a large extent, in North Korea. And I asked for it today, and we got it. That was a very last minute. The remains will be coming back. Theyre going to start that process immediately. But so many people, even during the campaign, theyd say, Is there any way you can work with North Korea to get the remains of my son back or my father back? So many people asked me this question. And, you know, I said, Look, we dont get along too well with that particular group of people. But now we do. And he agreed to that so quickly and so nice -- it was really a very nice thing, and he understands it. He understands it. So for the thousands and thousands -- I guess way over 6,000 that we know of, in terms of the remains, theyll be brought back. THE PRESIDENT: Right. It was discussed. It was discussed relatively briefly compared to denuclearization. Well, obviously, thats where we started and where we ended. But they will be doing things, and I think he wants to do things. I think he wants to -- youd be very surprised. Very smart. Very good negotiator. Wants to do the right thing. You know, he brought up the fact that, in the past, they took dialogue far -- they never went -- they never were like we are. Theres never been anything like whats taken place now. But they went down the line. Billions of dollars were given, and you know, the following day the nuclear program continued. But this is a much different time, and this is a much different President, in all fairness. This is very important to me. This is one of the -- perhaps, one of the reasons that I -- one, I campaigned on this issue, as you know very well, John. Okay. Whoever those people are. I cannot see you with all the lights, but you dont look like either of the two. Yeah, go ahead. Sure. Go ahead. THE PRESIDENT: Well, at a certain time, I will. I said that will be a day that I look very much forward to, at the appropriate time. And I also will be inviting Chairman Kim, at the appropriate time, to the White House. I think its really going to be something that will be very important. And he has accepted. I said, at the appropriate time. We want to go a little bit further down the road. THE PRESIDENT: Oh, you have not? Okay. Well, if you could have those agreements passed out. We just finished them, just a little while ago. But if you could have the agreements passed out, well -- youll see what were talking about. THE PRESIDENT: Thats true. Fifty-thousand great troops. Thats true. Yeah, it did -- abduction. Absolutely. This is Prime Minister Abes -- one of his, certainly -- other than the whole denuking subject -- certainly his, I would say, his main point. And I brought it up. Absolutely. And theyre going to be working on that. It will be -- we didnt put it down in the document, but it will be worked on. THE PRESIDENT: Christians, yes. We are -- brought it up very strongly. You know, Franklin Graham spent -- spent and spends a tremendous amount of time in North Korea. Hes got it very close to his heart. It did come up, and things will be happening. Okay? Thank you. Great question. Q Returning to the question of human rights, you spoke very powerfully on the issue during your State of the Union Address. You showed that -- you had the defector in the First Ladys box with the crutches, who escaped. And you, at that point, said that North Korea has more brutally oppressed its people than any other regime on Earth. Do you still believe that is the case having sat down with Kim Jong Un? And does he need to change that? THE PRESIDENT: Right. Jon, I believe its a rough situation over there. Theres no question about it. And we did discuss it today pretty strongly. I mean, knowing what the main purpose of what we were doing is: denuking. But discussed it at pretty good length. Well be doing something on it. Its rough. Its rough in a lot of places, by the way. Not just there. But its rough, and we will continue that. And I think, ultimately, well agree to something. But it was discussed at length outside of the nuclear situation, one of the primary topics. Steve. Thats you, Steve? Right there. Having sat down with Kim Jong Un. And does he have to change that? THE PRESIDENT: Jon, I believe it's a rough situation over there. There's no question about it. And we did discuss it today pretty strongly. I mean, knowing what -- the main purpose of what we were doing is: denuking. But discussed at pretty good length. We'll be doing something on it. It's rough. It's rough in a lot of places, by the way -- not just there. But it's rough. And we will continue that, and I think, ultimately, we'll agree to something. But it was discussed at length. Outside of -- outside of the nuclear situation, one of the primary topics. Steve? That's you, Steve? Right there. THE PRESIDENT: Well, you know, scientifically, I've been watching and reading a lot about this, and it does take a long time to pull off complete denuclearization. It takes a long time. Scientifically, you have to wait certain periods of time, and a lot of things happen. But despite that, once you start the process, it means it's pretty much over; you can't use them. That's the good news. And that's going to start very -- very soon. I believe that's going to start very soon. We will do it as fast as it can mechanically and physically be done, Steve. THE PRESIDENT: The sanctions will come off when we are sure that the nukes are no longer a factor. Sanctions played a big role, but they'll come off at that point. I hope it's going to be soon, but they'll come off. As you know, and as I've said, the sanctions right now remain. But at a certain point, I actually look forward to taking them off. And they'll come off when we know were down the road -- where it's not going to happen, nothing is going to happen. Okay? Q You signed a document with Kim Jong Un. It's essentially a piece of paper. Yesterday, we had a briefing from the Secretary of State Mike Pompeo. He said the following: "Many Presidents previously have signed off on pieces of paper only to find that the North Koreans either didnt promise what we thought they had, or actually reneged on those promises." What makes this time different, Mr. President? THE PRESIDENT: Well, you have a different administration. You have a different President. You have a different Secretary of State. You have people that are -- you know, it's very important to them. And we get it done. The other groups, maybe it wasnt a priority. I dont think they could have done it if it was a priority, frankly. I dont think they honestly could have done it even if it was a priority. And it would have been easier back then. It would have been -- for me, it would have been much easier if this were 10 years ago or 5 years ago. And I'm not just blaming President Obama. I mean, this goes back -- for 25 years, this should have happened. I was given a very tough hand. I was given this, I was given the Iran deal, and plenty of other problems. But we are -- we're doing really well. And the Iran deal, I have to be honest, I did it because nuclear is always number one to me. Nuclear is number one. But on the Iran deal, I think Iran is a different country now than it was three or four months ago. I dont think they're looking so much to the Mediterranean. I dont think they're looking so much at Syria, like they were, with total confidence. I dont think they're so confident right now. But I hope -- with that being said, I hope that, at the appropriate time, after these sanctions kick in -- and they are brutal, what we've put on Iran -- I hope that they're going to come back and negotiate a real deal, because I'd love to be able to do that. But right now, it's too soon for that. Q Mr. President, you also didnt talk about establishing diplomatic relations, exchanging ambassadors. How long before that happens? THE PRESIDENT: Good question. Hopefully soon. But we'll have to get things moving first. Very -- a little bit early for that. We have to get things moving. Q Can you clarify, when you said you were stopping "war games," so you are stopping the military exercises with South Korea? THE PRESIDENT: Yeah, we've done exercises for a long period of time, working with South Korea. And we call them war games, and I call them war games. And they're tremendously expensive. The amount of money that we spend on that is incredible. And South Korea contributes, but not 100 percent, which is certainly a subject that we have to talk to them about also. And that has to do with the military expense and also the trade. But the war games are very expensive. We pay for a big majority of them. We fly in bombers from Guam. I said -- when I first started, I said, "Where do the bombers come from?" "Guam. Nearby." I said, "Oh, great, nearby. Where's nearby?" "Six and a half hours." Six and a half hours -- that's a long time for these big massive planes to be flying to South Korea to practice and then drop bombs all over the place, and then go back to Guam. I know a lot about airplanes; it's very expensive. And I didnt like it. And what I did say is -- and I think it's very provocative, I have to tell you, Jennifer, it's a very provocative situation when I see that, and you have a country right next door. So under the circumstances that we are negotiating a very comprehensive, complete deal, I think it's inappropriate to be having war games. So, number one, we save money -- a lot. And number two, it really is something that I think they very much appreciate it. THE PRESIDENT: Well, weve gotten -- you know, Ive heard that. I mean, some of the people that -- I dont know, maybe they really mean it. I dont always want to go against the press because I just dont -- especially not today, this is too important. But I noticed that some of the people were saying that the President has agreed to meet, he has given up so much. I gave up nothing. Im here. I havent slept in 25 hours, but I thought it was appropriate to do -- because we have been negotiating for literally around the clock with them, and with us, and with John, and with Mike, and a whole team of very talented people. But we havent given up anything, other than -- youre right, I agreed to meet. And I think the meeting was every bit as good for the United States as it was for North Korea. But I just wrote down some of the things we got. And they -- you know, they -- sure, they got a meeting. But only a person that dislikes Donald Trump would say that Ive agreed to make a big commitment. Sure, Ive agreed to take a period of time and come here and meet, and thats good. But I think its great for us, as a country, and I think its good for them. But what did they do to justify this meeting? Secured commitment for complete denuclearization; thats the big thing. They secured the release of three American hostages. They already gave them to us two months ago. These people are now living happily back in their homes, with their families. And it was pretty rough for them, to put it mildly. Secure the commitment to recover the remains, including -- these are of fallen heroes. And theyre giving a commitment, theyre starting it immediately, to recover their remains. And I just went through how many people asked me about it. I was amazed, actually. So many people would ask me, Is it possible? Is it possible? At that time we had no relationship to Chairman Kim or to anybody else in North Korea. You know, it was a very closed society. So were getting the remains back. Secured the halt of all missile and nuclear tests for -- how long has it been? Seven months? You havent had a missile go up. For seven months, you havent had a nuclear test; you havent had a nuclear explosion. I remember a nuclear event took place -- 8.8 in the Richter scale. And they announced -- I heard it on the radio -- they announced that a massive -- you know, an earthquake took place somewhere in Asia. And then they said it was in North Korea. And then they found out it was a nuclear test. I said, I never heard of a Richter scale in the high 8s. And if you look, there has been no missile launches. Theyve blown up their missile area. Thats going to take place. That has not been written into the contract. Were going to give you the exact details on that. But they secured a halt of all missiles and of all nuclear tests. They secured the closure of their single primary nuclear test site. All three of them -- theyre in an area thats common around each other -- they secured the closure. They secured the commitment to destroy the missile engine testing site. That was not in your agreement. I got that after we signed the agreement. I said, Do me a favor. Youve got this missile engine testing site. We know where it is because of the heat. Its incredible the equipment we have, to be honest with you. I said, Can you close it up? Hes going to close it up. We maintained the ability to continue to apply sanctions. So were applying sanctions. Now I had 300 sanctions that I was getting ready to put on last week. And I said, you know, I cant really put on sanctions when Im meeting with -- I thought it would be very disrespectful. Three hundred very big ones, powerful ones. And I said it would be disrespectful. So, Jennifer, when you look at all of those things that we got -- and when we got our hostages back, I didnt pay $1.8 billion in cash like the hostages that came back from Iran, which was a disgraceful situation, what took place. So weve gotten a lot. So when I hear somebody in the media say that President Trump has agreed to meet -- like, its not a big deal to meet. I think we should meet on a lot of different topics, not just this one. And I really believe a lot of great things can happen. Q Sir, you just listed off a lot of things that you say you got in this meeting. It wasnt too long ago, though, that you said you defined the success of this meeting by North Korea giving up its nuclear weapons. THE PRESIDENT: Well, thats what theyre doing. Q -- how you pressed Kim Jong Un for complete, verifiable, irreversible denuclearization? Q And can you why you didnt secure those details in this agreement? THE PRESIDENT: Because there was no time. Im here one day. Were together for many hours intensively, but the process is now going to take place. And I would be surprised, Mike, if they havent even started already. They have started; they blew up their sites. They blew up their testing site. But I will say, he knew, prior to coming -- you know, this wasnt like a surprise. It wasnt like weve never discussed it. We discussed it. Mike discussed it very strongly with his counterpart in North Korea. They knew that this was -- lets say they didnt agree to that I couldnt sign any agreement. There was no agreement that could have been signed. So they understood that. And it wasnt a big point today because, really, this had been taken care of, more than any other thing. Because it was all about this. This has been taken care of before we got here. So when we brought that up today, you see the language. Its very strong. Its in the document. Q Thank you, Mr. President. Could you talk about the military consequences for North Korea if they dont follow through on the commitments that youre talking about? Could there be military action? THE PRESIDENT: Well, I dont want to talk. Yeah, I know. Thats a tough thing to talk about because I dont want to be threatening. I dont want to be threatening. They understood that. And youve seen what was, perhaps, going to happen. And you know, Seoul has 28 million people. We think we have big cities. You look at New York, where it has 8 million people. We think its a big city. Seoul has 28 million people. Think of that. And its right next to the border. Its right next to the DMZ. Its right there. I mean, if this would have happened, I think -- you know, Ive heard, oh, a hundred-thousand people. I think you could have lost 20 million people, 30 million people. This is really an honor for me to be doing this because I think, you know, potentially, you could have lost, you know, 30-, 40-, 50 million people. The city of Seoul, one of the biggest cities in the world, is right next to the border. THE PRESIDENT: Well, at that time we needed, perhaps, fire and fury. Because we could not have allowed that kind of capability from the standpoint of the United States. And certainly, Japan wasnt going to allow it either. Japan is right next door. THE PRESIDENT: Today. Yeah, we had it made up by some -- I hope you liked it. I thought it was good. I thought it was interesting enough to show. One in English and one in Korean. And we had it made up. I showed it to him today. Actually, during the meeting -- toward the end of the meeting. And I think he loved it. They were giving -- we didnt have a big screen like you have the luxury of having. We didnt need it because we had it on a cassette and -- an iPad. And they played it. And about eight of their representatives were watching it, and I thought they were fascinated. But I thought it was well done. I showed it to you because thats the future. I mean, that could very well be the future. And the other alternative is just not a very good alternative. Its just not good. But I showed it because I really want him to do something. Now, I dont think I had to show it because I really believe he wants to -- I think he wants to get it done. Yes. Go ahead. Hows Staten Island Ferry doing? Okay? He wrote the best story about me with the Staten Island Ferry. And after that, hes never written a good story. Q Thats a long time ago, sir. THE PRESIDENT: I dont know what happened. Its a long time ago. Q Mr. President, its been a busy week for you on the international stage. Youre leaving this summit here in Singapore having determined that Kim Jong Un is a talented man. You left the G7 Summit a few days ago in Canada having determined that Prime Minister Trudeau is weak and dishonest. What do you say to Americas allies who worry that you might be jeopardizing our long-term alliances and who worry that you might be treating our historic friends as enemies and our historic enemies as friends? THE PRESIDENT: Well, first of all, I think its a very fair question. I had a very good meeting with the G7. And I left the meeting. And, Ill be honest, we are being taken advantage of by virtually every one of those countries. Very, very seriously. Now, the United States, because of bad management at the top, because of Presidents that didnt care about trade or didnt understand it or whatever reason. For many years, with China being, obviously, the most successful at it, but the European Union is second -- $151 billion we lost. They were represented at the meeting. And were being taken advantage of on trade. Canada does have very big advantages over us in terms of trade deficits. We have a big trade deficit with Canada, I was reading, where, oh, its actually a surplus. Not a surplus. Its either 17, but it could actually be 100. You know, they put out a document. I dont know if you saw it. They didnt want me to see it, but we found it. Perhaps they were trying to show the power they have. Its close to $100 billion a year loss with Canada. They dont take our farm products -- many of them. They charge what was 270 percent, but somebody told me the other day that a few months ago they raised it to 295 percent for dairy products. And its very unfair to our farmers, and its very unfair to the people of our country -- the workers, the farmers, the companies. And we are not able to trade. They have tremendous barriers up. They have tremendous tariffs. So when I put in a countervailing tariff just to get us up a little bit so the balance isnt so much -- its like this -- they said, Oh, thats so terrible. I said, Whats terrible? We have to catch you a little bit. We have to have a little balance. Even if its not complete, we have to have a little balance. I say this with many countries. Anyway, we came -- we finished the meeting. Really, everybody was happy. And I agreed to sign something. I asked for changes; I demanded changes. And those changes were made. In fact, the picture with Angela Merkel, who I get along with very well, where Im sitting there like this, that picture was were waiting for the document because I wanted to see the final document as changed by the changes that I requested. That was a very friendly -- I know it didnt look friendly, and I know it was reported like sort of nasty both ways. I was angry at her or she -- actually, we were just talking, the whole group, about something unrelated to everything, very friendly, waiting for the document to come back so I could read it before I leave. Anyway, I left and it was very friendly. When I got onto the plane, I think that Justin probably didnt know that Air Force One has about 20 televisions, and I see the television. And hes giving a news conference about how he will not be pushed around by the United States. And I say, push him around? We just shook hands. It was very friendly. Look, countries cannot continue to take advantage of us on trade. The number are out. Over the last couple of years, and over the last many years -- but over the last couple of years, this country has lost $800 billion on trade with other countries, the biggest one being China. Eight-hundred billion dollars. A hundred fifty-one billion with the European Union. They dont take our agricultural products, barely. They dont take a lot of what we have, and yet they send Mercedes into us, they send BMWs into us by the millions. Its very unfair, and its very unfair to our workers. And Im going to straighten it out. And it wont even be tough. Okay? Thank you. THE PRESIDENT: I would like to involve Congress, yes. And no, I have a good relationship with Justin Trudeau. I really did. Other than he had a news conference that he had because he assumed I was in an airplane and I wasnt watching. He learned. Thats going to cost a lot of money for the people of Canada. He learned. You cant do that. You cant do that. We laughed. We had a very good relationship. Ive had a good relationship with Justin. I have a good relationship with all. I have a very good relationship with Angela Merkel. But on NATO, were paying 4.2 percent; shes paying 1 percent of a much smaller GDP than we have. Were paying 4.2 percent on a much larger -- were paying for -- I mean, anyone can say -- from 60 to 90 percent of NATO. And were protecting countries of Europe. And then on top of it, they kill us on trade. So we just cant have it that way. Its unfair to our taxpayers and to our people. But no, I have a good relationship with Justin. And I have a, I think, a very good relationship with Chairman Kim right now. I really do. I think -- I hope its good because if it is, were going to solve a very big problem. I think weve gone a long way to solving it today. Should we keep going for a little while? Sarah? I dont know. Its up to the legendary Sarah Huckabee Sanders. Should we keep going, Sarah? Okay, well go. Well, I dont care. Hey, you know, it just means we get home a little later in the evening. Right? THE PRESIDENT: Yes. Were getting together next week to go into the details. THE PRESIDENT: Secretary Pompeo. Yeah. Next week, with John Bolton and our entire team, to go over the details and to get this stuff done. We want to get it done; he wants to get it done. Were also working very much with South Korea. Were working with Japan. Were working with China, to a lesser extent, but were working with China. THE PRESIDENT: I would come back gladly. Your Prime Minister was fantastic. We were with him yesterday. Hes done a great job. It was very welcoming. It really, probably had -- it probably made a difference, actually. Its a great place. THE PRESIDENT: Yeah. Ive said that about relationships. Ive said that about people. You know in the first second. Now, I was generous. I said five seconds. But you know in the first second, in some cases. Sometimes that doesnt work out. But sometimes it does. From the beginning, we got along. But theres been a lot of groundwork. This wasnt like we went and we started talking about -- as you know, right? We didnt just come in and start talking about these very complex subjects that have been going on for 70 years. Weve been discussing this for months. And, you know, once the rhetoric stopped, once they did a great thing --you know, North Korea did a great thing by going to the Olympics. Because the Olympics -- and President Moon will tell you this -- the Olympics was not exactly doing great. People didnt feel like being bombed out of the Opening Ceremonies. You know, they werent exactly selling tickets. And as soon as the Chairman -- Chairman Kim -- said, Lets participate in the Olympics, it sold like wildfire and was a great success as an Olympics. It was a great success. He did a great thing. But since that time, pretty much since that time -- because, as you know, a delegation came from South Korea who had just met with North Korea. They came to the White House. They told me lots of things, including the fact that theyd be willing to denuke. We have one of their great people here today. That they were willing to denuke. And once that started, we have been really talking about that from the end of the Olympics when the whole delegation came to say various things, including denuking. THE PRESIDENT: Well, I think can you ensure anything? Can I ensure that youre going to be able to sit down properly when you sit down? I mean, you cant ensure anything. All I can say is they want to make a deal. Thats what I do. My whole life has been deals. Ive done great at it, and thats what I do. And I know when somebody wants to deal, and I know when somebody doesnt. A lot of politicians dont. Thats not their thing, but it is my thing. I mean, again, this really could have been done, I think, easier a long time ago. But I know for a -- I just feel very strongly -- my instinct, my ability, or talent -- they want to make a deal. And making a deal is a great thing for the world. Its also a great thing for China because I cant imagine that China has, you know, is happy with somebody having nuclear weapons so close. So, you know, thats -- China was very helpful. So I think he wants to make a deal. Can anybody be certain? But were going to be certain soon because the negotiations continue. Okay? Thank you very much. Q I wonder what you would say to the group of people who have no ability whatsoever to hear or to see this press conference -- the 100,000 North Koreans kept in a network of gulags. Have you betrayed them by legitimizing the regime in Pyongyang? THE PRESIDENT: No, I think Ive helped them because I think things will change. I think Ive helped them. Theres nothing I can say. All I can do is do what I can do. We have to stop the nuclearization. We have to do other things, and thats a very important thing. So at a certain point, hopefully, youll be able to ask me a much more positive question or make a statement. But not much I can do right now. At a certain point, I really believe hes going to do things about it. I think they are one of the great winners today, that large group of people that youre talking about. I think, ultimately, theyre going to be one of the great winners as a group. THE PRESIDENT: No. I want significant improvement. I want to know that it wont be happening. And again, once you start that process, there will be a point at which, even though you wont be finished for a while because it cant happen scientifically or mechanically, but youre not going to be able to go back. You know, once we reach that point, Ill start to give that very serious thought. Q Mr. President, did you also discuss the cost of denuclearization and how North Korea is about to foot the bill while the crippling sanctions remain in place? Im from (inaudible) News Agency Singapore. THE PRESIDENT: Well, I think that South Korea and I think that Japan will help them very greatly. I think theyre prepared to help them. They know theyre going to have to help them. I think theyre going to help them very greatly. We wont have to help them. The United States has been paying a big price in a lot of different places. But South Korea, which obviously is right next door, and Japan, which essentially is next door, theyre going to be helping them. And I think theyre going to be doing a very generous job and a terrific job. So they will be helping them. Yes, maam. Go ahead. Behind. Yes. Q Id like to follow up on Steves question. He asked you how long it would take to denuclearize the Korean Peninsula. You said a long time. What does that mean? THE PRESIDENT: Well, I dont know, when you say a long time. I think we will do it as fast as it can be done scientifically, as fast as it can be done mechanically. I dont think -- I mean, Ive read horror stories. Its a 15-year process. Okay? Assuming you wanted to do it quickly, I dont believe that. I think whoever wrote that is wrong. But there will be a point at which, when youre 20 percent through, you cant go back. I had an uncle who was a great professor for, I believe, 40 years at MIT. And I used to discuss nuclear with him all the time. He was a great expert. He was a great, brilliant genius. Dr. John Trump at MIT. I think he was there 40 years, I was told. In fact, the head of MIT sent me a book on my uncle. But we used to talk about nuclear. Youre talking about a very complex subject. Its not just like, Oh, gee. Lets get rid of the nukes. It takes a period of time. But the main period of time that Im talking is that first period, when you hit a certain point you cant go back. Its very hard to go back. THE PRESIDENT: We dont know, but it will go pretty quickly. Q You alluded at the very beginning that the Chinese are not doing as great a job securing the border as they were before. You expressed some doubts when Kim went to see President Xi. The Russian foreign minister was in Pyongyang and said there shouldnt be any sanctions while these negotiations are under way. And the South Koreans are now talking about restoring some form of trade. So with all of those players appearing to be moving toward eroding sanctions, how can you keep the sanctions regime in place? What leverage do you have on these countries? THE PRESIDENT: Well, I think we have a lot of leverage. I think we have tremendous leverage. I do believe that China, despite my relationship with President Xi -- a man who I told you I have great respect for and like, also, a lot. You know, were having very tough talks on trade. And I think that probably affects China somewhat. But I have to do what I have to do. And I think, over the last two months, the border is more open than it was when we first started. But that is what it is. We have to do it. We have a tremendous deficit in trade, commonly known as a trade deficit. We have a tremendous deficit in trade with China, and we have to do something about it. We cant continue to let that happen. And I think that has had an impact on my relationship, in terms of the border. I dont think it has the relationship -- you know, I dont think it affects my feeling or my relationship to President Xi. But when we first started, we werent ready to go that route. And as we started preparing and getting ready to do that, I think thats had an impact on, frankly, the border. Which is a shame. But I have to do it. I have no choice. For our country, I have to do it. South Korea will do whatever is necessary to get a deal done. And if that means we cant trade, then Im not going to trade. Theyre definitely not going to trade. If they think -- and they would do this with our concurrence -- if they think that they can do some work because were very far down the line -- were actually very far. You know, that document, when you read it today, thats far down the line. Thats not something that just happened to be put together. This was done over months. And again, the rhetoric was important, and the sanctions were important. I dont even know which one was more important. They were both important. Q Mr. President, David Sanger for The New York Times. I was wondering if you could give us some sense of whether the Chairman Kim told you how many nuclear weapons he believes hes made, whether hes willing to turn those over first, and then whether, in your mind, you need to do more than was done in the Iran deal for actually dismantling the -- both the uranium and the plutonium processes. And whether or not you had a sense that Chairman Kim really understood what that involves and had a timetable in his own mind of shutting that. THE PRESIDENT: Well, David, I can tell you he understands. He understands it so well. He understands it better than the people that are doing the work for him. That is an easy one. As far as what he has, its substantial. Very substantial. The timing will go quickly. I believe youll see some good action. I mean, as an example, one of the things with the missile site, I think youre probably surprised to hear that -- that was a throw-in at the end, the missile site. But I really believe, David, that its going to go very quickly. I really believe that its going to go fast. And it is a very substantial arsenal. Theres no question about it. You know, I used to say maybe its all talk and no action. But we have pretty good intelligence into that. Although, probably less there than any other country. You understand that maybe better than anybody in the room. Probably less there than any other country. But we have enough intelligence to know that what they have is very substantial. This is why, David, I always say that this shouldnt have taken place so late into the process. Wouldnt this have been better if it was 5 years ago or 20 years ago or 15 years ago and we didnt have to worry about not having a successful meeting like today? So -- and I still love my first interview with you, David. I still have that interview, actually. Q (Inaudible) the second summit -- if there is a second summit with Chairman Kim Jong Un, would it be in Pyongyang or Washington? THE PRESIDENT: We havent set that up. Well probably need another summit. Well probably need -- or meeting. We can use a different term. But well probably need another one. Well probably -- I will say this, were much further along than I would have thought. I did not think wed be here. I thought -- and Ive told people -- I didnt want to build up peoples hopes too much. I told people I thought that this would be a successful meeting if we got along, we developed a relationship, and we could have maybe gotten to this point in three or four months from now. But it really happened very quickly. A lot of that was because of the foundation that was, you know, put down before we met. A lot of things happened very fast. We didnt have -- as an example, bringing back the remains. That was not one of the things that was on our agenda today. I brought that up at the very end because so many people have talked to me about it. And I brought it up at the very end. And he was really very gracious. Instead of saying, Well, lets talk about it the next time. He said, It makes sense. We will do it. And he knew -- you know, they know where many of those incredible people are. Where theyre buried along roads, along highways, along paths, usually, because our soldiers were moving back and forth and they had to move rapidly. Its very sad. But he knew. And that was brought up at the very end. And you know, it was really great that he was able to do it. A lot of people are going to be very happy about that. THE PRESIDENT: Thank you. Thank you for the nice way you treat us. We appreciate it. Really, its very good. Its really beautiful what you do. Go ahead. THE PRESIDENT: And now Ill probably get this killer question. THE PRESIDENT: Yeah. Its all right. Q Specifically the people are -- Kim Jong Un is saying hes wanting a brighter future with prosperity for his people, yet we know theyve lived under oppression. You showed him this video of what the future can be like. But do you have an idea specifically of the model that you would like to go towards? Economically, is he open to more economic freedom? THE PRESIDENT: Yeah, its a good question. So you saw a tape today, and that, I think, was done really well. But that was done at the highest level of future development. I told him, you may not want this. You may want to do a much smaller version of this. I mean, youre going to do something. But you may want to do a smaller version. You may not want that with the trains and the everything. You know, its super -- everything the top. And maybe you wont want that. Its going to be up to them. Its going to be up to them. Its going to be up to the people what they want. They may not want that. I can understand that too. But that was a version of what could happen, what could take place. As an example, they have great beaches. You see that whenever theyre exploding their cannons into the ocean, right? I said, Boy, look at the view. Wouldnt that make a great condo behind? And I explained, I said, You know, instead of doing that, you could have the best hotels in the world right there. Think of it from a real estate perspective. You have South Korea, you have China, and they own the land in the middle. How bad is that, right? Its great. But I told him, I said, you may not want to do whats there. You may want to do a smaller version of it or -- you know. And that could be. Although, I tell you what -- he looked at that tape, he looked at that iPad, and Im telling you they really enjoyed it, I believe. Okay? Yeah. Go ahead. A couple more. Okay. Well do three more. Yeah. Go ahead. Go. THE PRESIDENT: Yes. Hi, Brian. Am I on the cover again this week? Boy, have I -- so many covers. THE PRESIDENT: Huh? I know. Thats okay. THE PRESIDENT: No. I think that -- I dont view it that way. See, I dont view it that way. Ill do whatever it takes to make the world a safer place. If I have to say Im sitting on a stage -- I mean, I understand what youre getting at. If I have to say Im sitting on a stage with Chairman Kim and thats going to get us to save 30 million lives -- could be more than that -- Im willing to sit on the stage. Im willing to travel to Singapore very proudly, very gladly. Again, I -- you know, other than the fact that it is taking my time, they have given up a tremendous amount. Theyve given it up even before. And even add the Olympics to it. You know, you could add the Olympics to the question. They went to the Olympics. They took an Olympics that was going to be a massive failure that maybe wouldnt have even opened, and they made it a tremendous success by agreeing to participate. Add that to the list of things that theyve done. So, Brian, if I can save millions of lives by coming here, sitting down, and establishing a relationship with someone whos a very powerful man, whos got firm control of a country, and that country has very powerful nuclear weapons, its my honor to do it. THE PRESIDENT: No, Im not concerned at all. We can use that video for other countries. Q Mr. President, you, on the other hand, got the request and right away went here to meet him. And do you understand those people who say that you gave him the ultimate present -- the legitimacy to a regime who oppress its people without an ongoing process before you, as the U.S. President, as the leader of the free world, meet and shake hands with this leader of North Korea who is perceived to be oppressing brutally his own people? Q Yeah. I know you said the last thing was an add-on and it wasnt in the agreement, but that he gave you his word. If he doesnt follow through on these things, what are you prepared to do in response? And will you lose faith in this process? THE PRESIDENT: No. I think hell do it. I really believe that. Otherwise, I wouldnt be doing this. I really believe it. And it was really the engine testing site, in addition to all of the other things that theyve agreed to do. It was the -- they have a very powerful engine testing site that, again, were able to see because of the heat that it emits. And, yeah, Im able to -- Im very happy. Ill tell you what -- Im very happy with those two points -- the two points you mentioned. Q (Inaudible) with Xinhua Media Group China. I just would like to know, will you call Chinese President Xi when you come back to D.C. to discuss about achievements you made today with Chairman Kim? Q And what's your expectation about Chinas role to accelerate the process to establish a long-term peace mechanism? THE PRESIDENT: Well, my expectation about China is that China is a great country with a great leader, and a friend of mine. And I really believe that hes happy that weve made this kind of progress. And Ive heard from him. But I will be calling him very shortly. Maybe even before I land. Okay? And I have to say, you know -- and the United States is a great country. And we have set records economically -- over $7 trillion in net worth addition to what we have. And we are almost twice the size, the economy of the United States. Nobody talks about this, because you do hear a lot about China, rightfully so. But the United States, now, is almost twice the size of the economy of China. We have a great country and were on a correct path. THE PRESIDENT: Oh, South Korea? Wheres South Korea? I think you deserve -- go ahead. Go. You deserve one. Yes. You deserve one. Q Ive got two questions for you, Mr. President. First, you mentioned earlier that youre going to talk with South Korean President Moon Jae-in over the phone. THE PRESIDENT: I just want to tell him about the meeting. Very successful. And hell be very much involved in the final negotiation. Hes a very, very fine gentleman. Also a friend of mine. And I look forward to speaking. Hell be very happy when he hears about -- Ive already sent word to him about what happened. I sent the document to him, actually, and all of the details behind the document. So Ill be talking to him very shortly. Q If I may ask another question. In signing the peace treaty, do you hope to -- do you plan to work this out with North Koreas Chairman Kim only, or what do you think about the involvement of South Korea and China as the signatories? THE PRESIDENT: Id like to have them involved also. Theres a question as to whether or not were supposed to or whether or not we legally have to. I dont care. I think it would be great to have China involved and also, of course, South Korea. Okay? THE PRESIDENT: No, they didnt record it. I dont think they recorded it. Are there any recordings of it? I wish there were. Because it is interesting stuff. THE PRESIDENT: I dont. We probably have some notes or something. But they have, actually, detailed notes, I would imagine. But we had a great conversation. It was a very heart-felt conversation. THE PRESIDENT: Well, I dont have to verify because I have one of the great memories of all time. So I dont have to. Okay? Okay? THE PRESIDENT: Yeah, but I dont want to discuss it. But we did is weve had numerous discussions. Weve had very important relationships established at Mikes level and other levels. In fact, a couple of people are here from, as you know, from North Korea. Theyre in the room. We have a few people in the back also, in the room. So when we went into this final agreement, very importantly, we really didnt go in cold. We went in with tremendous relationship and tremendous knowledge. And I think thats why we got it done. So Mike, our whole team has to get to work and get it completed. Because otherwise, weve done a good job. But if you dont the ball over the goal line, it doesnt mean enough. Okay?